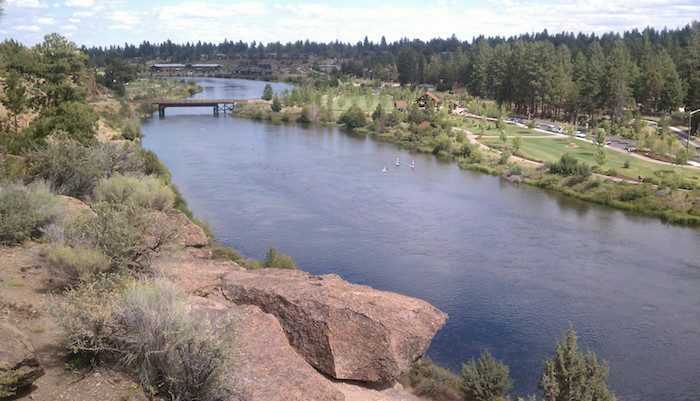 The Deschutes River Trail System is the crown jewel of the Bend Parks and Recreation Department’s Urban Trails System. Once fully developed, it will consist of 19 contiguous miles of trail alongside the river, but today there are 11 miles of completed sections, for a long loop or an out and back. The various sections of the trail are known as “reaches,” which are characterized by neighborhoods and surrounding landscapes. Although you can choose to run any of the five reaches (or a combination of them) the local favorite routes are the River Run Reach and the Old Mill Reach. Farewell Bend Park makes an easy three-mile loop past gurgling rapids and waterfalls. At the southernmost end, the River Trail links up with the Lava Connector and runs all the way to nearby Sunriver. Note that the trails along the river are not contiguous — best to pick one of the ‘reaches’. River Run Reach/First Street Rapids: Sawyer Park is the gateway to River Run Reach, which is a favorite for its wide and flat gravel trails. You can park at Sawyer Park and head out over the footbridge which connects a series of scenic wetlands. Don’t be surprised to spot an otter, beaver, or even as osprey at this wildlife viewing hotspot. Just south of Sawyer Park is First Street Rapids Park, a popular destination for canoes and kayakers accessing the river. Like other easy access points on the river, First Street Rapids can be busy, but the groomed gravel trails here are irresistible for running. Starting from the park and heading south, there is about a 4 mile out and back traversing both sides of the river. Of course, there’s always the option to keep going, but we’ll let your legs be the judge of that!